Greeks and Turks don't have as much Indo-European ancestry as northern Europeans, that's why. Although they do show fairly decent frequencies of the typical R1 Indo-European lineages, which is easy to see. The authors should have gauged their timings with actually available ancient DNA. Their argument for rejection of this method appears ridiculous: "...firstly because of uncertainty over how archaeological date estimates correlate with demographic changes, and secondly because we have used a coalescent-based dating method that itself models genealogies.." Needless to say, their mutational rate is about 30% faster than that based on ancient DNA. This can mean the difference between, e.g., climate-change induced population reductions in the Chalcolithic and full-blown Bronze Age, or between the Copper Age and the Bronze Age. R1a-M198, here ~6,000 ya, but Underhill found ~10,000 to 16,000 ya, depending on region. R1b-M269, here ~5,500 ya, but Karafet had <~19,000 ya. R1b- M269 is R1ba2. NOT R1b as is implied in the tree. S116 is R1b1a2a1a2. This is western European and includes the Germanic and Iberian R1b groups. I would have liked to see dating of the older R1bs and comparison to the ancient firmly dated R1. J2a-M92 here. Ultimate origin of Anatolia. I think it says great things about my tribe that we are NOT on this list. The lack of a bottleneck just supports what I've been saying about us the past few months. We've been so successful at building empires precisely because we're a broad-range "consensus" race; and not the "winner take all" kind. This makes for a much stronger foundation for empire and high religion. That's actually been the main point of my series "Working Through the Phaistos Disc" and "The Children of Proteus." Here's the part of the latter where I really hammer that home. Part V: Flocking Together. Here you see the exact same behavior in Central Italy, Crete, and Çatalhöyük. What I see in the populations is as follows, working back from the present day. Palestine and amazingly steady population until the last millenia when the effective population size started diving towards extinction. Seems believable given the horrific history of this cursed land since the Roman invasions. The Saami like the Palestinians are in major decline but they also took an initial population hit 2-3 kya at about the same time as Serbia and Greece. This seems to correspond to the collapse of the Ancient Greek Mycenaean civilization. which may have been precipitated by a 300 year drought. IMO the hump in the Greek graph is ancient (Bronze Age) Greece. This population collapsed (Greek Dark Ages) and was followed by the classical period and on to the present day. Ireland, Basques,Spain, England, Denmark, Norway, Bavaria and Italians (TSI) took a major hit about 4kya and then the population exploded. Orkney looks to be a little later but the place is small so this could be within error. War at the start of the Bronze age most probably IMO. The Turks are weird. They have the largest effective population back to the paleolithic. The population actually takes a hit exactly at the start of the neolithic!! Did it arrive from elsewhere causing disruption or was innovation stimulated by a catastrophe? The Turks are the only folk who seem to have a rise in effective population as the neolithic gets underway (around 11kya). Nothing similar is seen in Europe 5-7kya as the neolithic arrives there. There is also a paleolithic population surge around 35kya. Is this hump an Aurignacian "civilization" in Anatolia that predated the Greeks? There is a kind of poetry in the imagining of slow walk of evolving cultures from the East to the West. Correction. The Greek population also rises with the the arrival of the neolithic. It is not just the Turks. - The lack of bottleneck in Greeks and Turks suggests that the present-day high incidence of J2a in these populations is the result of mass immigration of this haplogroup eventually after the early Neolithic (according to ancient DNA J2a wasn't part of the early European Neolithic). This is also suggested by the high TMRCA of J2a. 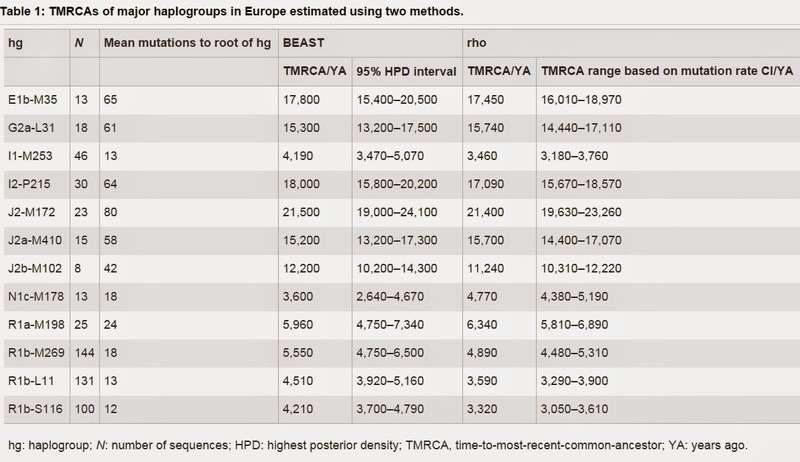 - The low TMRCA of I1 makes it very evident how this haplogroup "became Indo-European". 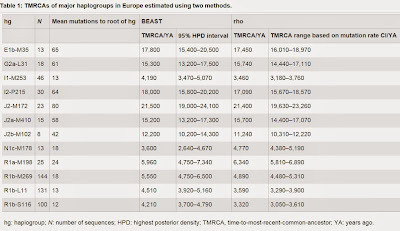 At the TMRCA of I1 the population in question was already thoroughly Indo-Europeanized, and since genetic testing didn't exist back then, the MRCA had no reason to consider himself ethnically different. This proves the absurdity of the idea that haplogroup trees always correspond closely to ethno-linguistic trees, and that the most common, most typical haplogroup of a population must be associated with those who had brought the language of this population.